I did some verification and I can not use more than 256 audio elements (mono or stereo). This means 512 channels in stereo or 256 channels in mono. (It also seems that Hauptwerk does not want to open up if it finds a sound card with more than 512 channels). 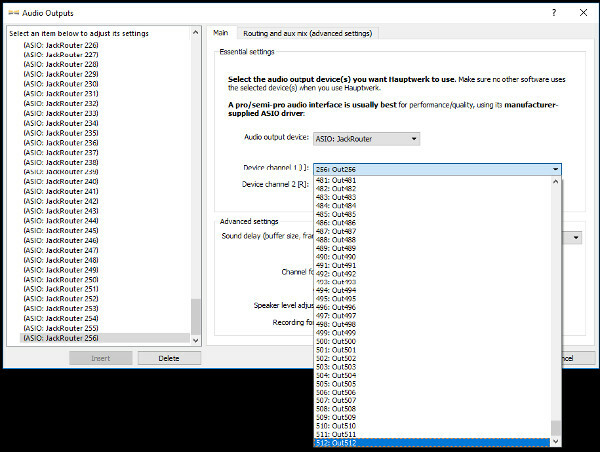 It may seem like an exaggeration to use all these channels but if you plan to expand Hauptwerk internal voicing tools with other external voicing tools (=DAW plugins) for every single stop then they are not so many. For example, with a setting of 12 mono channels "Tone matching mode 1" you can manage 21 stops (12*21 = 252) instead with a setting of 6 mono channels "Tone matching mode 1" you can manage 42 stops (6*42 = 252). In short, I wonder if there was a mistake to limit the number of monophonic channels to 256 and if there is a way to disable this limit even at the risk of using a configuration not supported by the Hauptwerk team. I think it is better if you address this to Mr. Brett Milan and not the forum. I am sure he can help you better than any of us can. How Many speaker- Amp., channels, do any of us expect to Utilize ? Thomas, I will write to Mr. Brett Milan if there is any confidential configuration information that can not be shared in the forum. Generally speaking, if a sound works well you do not need to change it a lot and the Hauptwerk voicing tools are very effective for every single note (without being heavy for the CPU). Often the dry (and semi-dry) sounds are blurred and need specific treatments to make them more present than the particular acoustics. Hauptwerk is not a host for VST / AU plugins so for now the only way to handle the sounds in a deeper way is outside of Hauptwerk (or with offline treatments by rewriting the audio files if they are not encrypted). It is also possible to treat the most problematic ones or even a related set. It must be remembered that the digital mix in the same channel can create annoying intermodulation distortions especially with the intervals different from the octave or unison. For this reason 12 channels are used for the twelve semitones of the chromatic scale. TheOrganDoc, all this talk speaks only of the voicing tools (internal or external to Hauptwerk) and is only partially related to the physical audio resources that you want to use. For example, in the image above you can see 8 channels that are *dynamically* allocated with respect to the 12 chromatic scale sounds to avoid intermodulation distortions (up to 8 different simultaneous sounds of course). The dynamic allocation ( from 12 to 8 ) is obviously done outside of Hauptwerk. The dynamic allocation of audio channels is something I've thought about many times. It is good to see you are actually doing it. I would enjoy hearing more about this. Looks like the 256 and 512 got reversed in title of the thread. I assume you meant 256 stereo channels which would be 512 audio channels. Looks like the 256 and 512 got reversed in title of the thread. I assume you meant 256 stereo channels which would be 512 audio channels. As you can see from the image on the top, the [Insert] Hauptwerk button is DISABLED after you've added 256 audio elements regardless of whether they are stereo or mono. This means that you can use up to 256 mono channels (or 256*2 channels if you want to work in stereo). The dynamic allocation of audio channels is something I've thought about many times. It is good to see you are actually doing it. I would enjoy hearing more about this. Let's start with the fact that Hauptwerk's default channels allocation is very effective at distributing sounds equally everywhere. Statistically it should work well. I can not use the default Hauptwerk allocation if I also want to use additional voicing tools outside Hauptwerk (=within the DAW). For this reason the 12 semitone pattern ("Tone matching mode 1" with 12 channels) is the most effective to isolate the octaves to be treated with the DSP audio plugins. 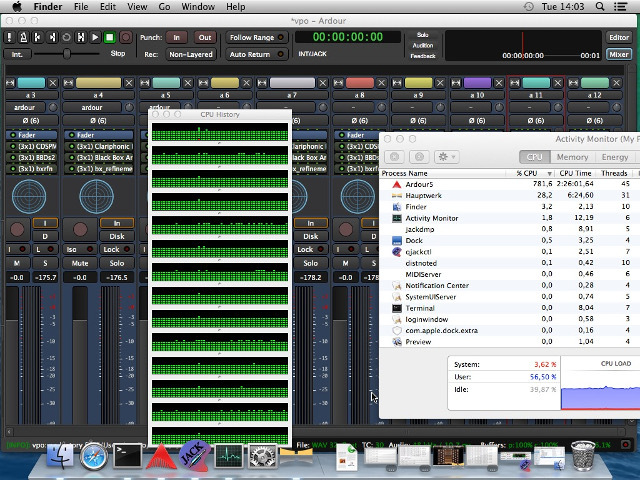 Once you have done this you will have in the DAW the mirror of the audio groups you define in Hauptwerk. There may also be a hybrid configuration: it is you who decide how to structure things keeping in mind that the same audio channel can belong to only one group in Hauptwerk. Similarly in the DAW you will have to decide how to organize all the channels coming from Hauptwerk and going to the speakers. It is not that one setting is better than the other, it is always a compromise and a choice based on some priorities. In this case, using dynamic allocation allows you to get considerable savings on audio resources in the sense that if you do not need to play with clusters and you just need a few triads to accompany the chorus then instead of taking 12 speakers (with a static allocation of 12 to 12) you could only take 4 speakers (with a dynamic allocation of 12 to 4) having approximately the same result as 12 speakers. No magic, only compromise more or less effective. At the implementation level with Ardour DAW you can define Lua DSP scripts and build your routing logic. For example, I also use the ARDOUR.DSP.compute_peak() method to track the status of the 12 input channels in order to make mixing output decisions. 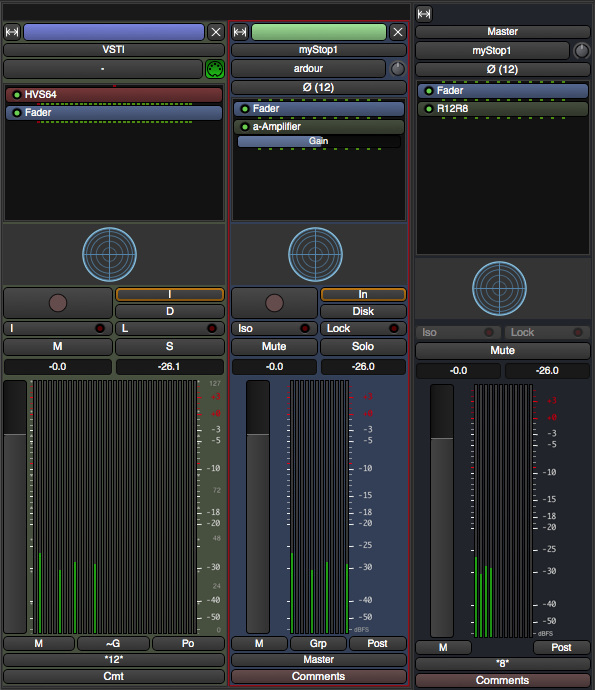 I repeat that this is only a way of doing, the priority is the additional DAW sounds voicing tools, avoid mixing intermodulation distortion and the overall price/performance ratio. elia wrote: The dynamic allocation ( from 12 to 8 ) is obviously done outside of Hauptwerk. engrssc wrote: By means of software? Exactly, you can see below how in the Master track the "R12R8" plugin reads the 12 input channels and allocates them in the first free output channels (for example). The plugin is written in Lua and works only with Ardor but it is quite simple that you can think of using a csound DSP audio engine ( https://csound.com ) and export the result as a VST/AU plugin through Cabbage ( http://cabbageaudio.com ). In this way you could use it on any DAW. I'm glad I'm not the only one that hears this. I had real pipes playing for many years prior to HW, and I can say the beats they produce are not objectionable. The electronic reproduction however accentuates them and makes them irritating to listen to. Sometimes I swear it's distortion, and maybe it is, as you say. Eric, this is just my opinion - with pipes, the wave forms come at us from different sources, many of which are widely separated. The phases vary with our ear's position relative to the pipes. With Hauptwerk, all the digital waveforms are being fed simultaneously to a relatively small number of speakers, and hence the intermodulation distortion is occurring in the speakers themselves. The drivers are trying to move in different directions at the same time, something speakers can't handle. I absolutely love my Hauptwerk, but it will never reproduce a pipe organ with complete accuracy unless there is one speaker for each pipe of the digitized organ. BUT, I'm happy with what I have at home! 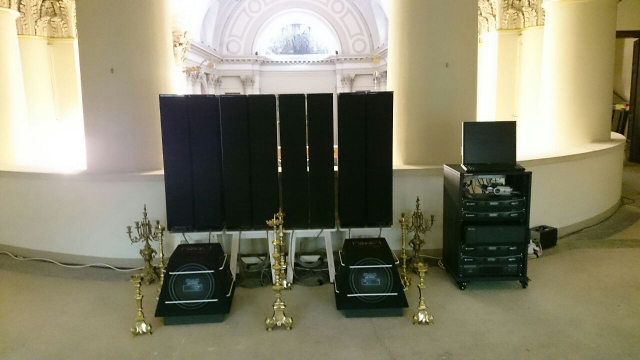 RaymondList wrote: I absolutely love my Hauptwerk, but it will never reproduce a pipe organ with complete accuracy unless there is one speaker for each pipe of the digitized organ. Approaching the cost of real pipes? Maybe not but certainly not realistic for the "average" organist. If there such a thing as "average". Guessing that might take up a lot of space. Deleted. Hit the post button too soon. Last edited by Eric Sagmuller on Thu Sep 20, 2018 8:22 pm, edited 1 time in total. RaymondList wrote: Eric, this is just my opinion - with pipes, the wave forms come at us from different sources, many of which are widely separated. The phases vary with our ear's position relative to the pipes. With Hauptwerk, all the digital waveforms are being fed simultaneously to a relatively small number of speakers, and hence the intermodulation distortion is occurring in the speakers themselves. The drivers are trying to move in different directions at the same time, something speakers can't handle. I absolutely love my Hauptwerk, but it will never reproduce a pipe organ with complete accuracy unless there is one speaker for each pipe of the digitized organ. BUT, I'm happy with what I have at home! Even with it's flaws, I really do enjoy playing my HW instrument and find it's a better alternative than pipes in the house. I also find that the wetter a set is, the less the beats bother me. I suspect the phases are less pronounced due to the room reflections captured in the sample. What Elia presents is quite interesting. I need to read the posts more carefully. Eric Sagmuller wrote: I'm glad I'm not the only one that hears this. I had real pipes playing for many years prior to HW, and I can say the beats they produce are not objectionable. The electronic reproduction however accentuates them and makes them irritating to listen to. Sometimes I swear it's distortion, and maybe it is, as you say. , if there were 100 stops, I can not think that sampling should be done for all possible stops combinations, perhaps for ALL stops and other combinations that could benefit most...?). Returning to IMD (intermodulation distortion), who could like the C major chord at the end of my sound example? It is best to maximize the resources you have and if you start from well recorded and processed dry sounds you can do a very interesting job. I would focus on the possibility of being able to play satisfactorily and with a credible sound, for what is possible today. Even if today the electronic instrument can be considered a surrogate of the real instrument, tomorrow you will be able to make interesting sounds (in particular the synthesized sounds by various methods) that will be impossible to do with a real instrument and this will allow greater emancipation and respect. I have all along said that I can hear a difference between a CD recording and the virtual organ. And I believe if a stop combination were sampled and played back as such on a VPO, that it would sound better than digitally combining all of the stop after the fact. Just my humble opinion of course.